Oppositional Defiant Disorder (ODD) is a disorder where children have disruptive and oppositional behaviour that is particularly directed towards authority figures, such as parents or teachers. ODD is less severe and more common than conduct disorder. 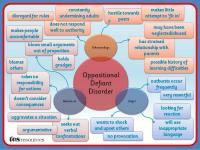 Children with ODD are constantly defiant, hostile and disobedient. They don’t like responding to instructions or taking orders from others, and they actively refuse simple requests. Sometimes they eagerly blame others for their own mistakes, can lose their temper easily, and act in an angry, resentful or touchy manner. Oppositional: hostile or confrontational action or behaviour. All children occasionally react in this way on a bad day or if upset by a situation, and many teenagers go through troublesome times. 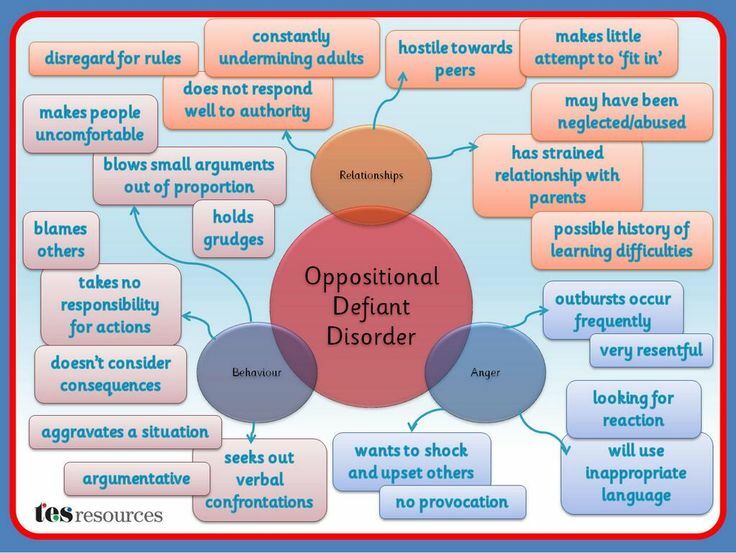 But children with oppositional defiant disorder are like this much of the time, making them very hard to deal with. To be classified as ODD, the behaviour also has to have caused a significant degree of disturbance to home, social or school life. How does it cause problems? For parents, having a child with ODD can be very difficult. refuse to do what he’s told. It's common for a child with ODD to blame everyone else for his problems, and at his worst he can be hostile, spiteful and vindictive. These types of problem behaviours are typically directed towards parents and teachers, plus others in authority although they can also be directed by siblings and peers. Coping with a consistently disruptive attitude can be extremely frustrating and physically, mentally and emotionally exhausting. ODD is common in children with ADHD, however many of the same general approaches to parenting and behaviour management can be used in either disorder. A typical behavioural approach will help you learn how to deal with your child’s defiance in an effective manner, using tried and tested techniques such as setting achievable goals and reinforcing positive behaviours. It can be carried out on a one-to-one basis with parents, or in a group if there are several families needing help at any one time. Group work can be helpful because it offers extra support for parents and confirmation that it’s not just your family going through the difficulties of ODD. ODD children can be very demanding, so learning new ways of dealing with your child's behaviour can prove challenging. For example, although you may feel at the end of your tether, arguing or shouting back at your child isn’t the best approach. Instead you’ll be encouraged to learn new ways of dealing with behaviour such as confrontations, arguing and impulsive rages. Insight will be given into how oppositional children think, so you can begin to understand why your child acts this way. Treatment is likely to encourage talking to your child and helping him to acknowledge his behaviour. It will also focus on ways of using praise to improve behaviour and address the issue of control - one of the things ODD children strive for. A number of treatment options have proven effective for the management of ODD. It is vital that parents are actively involved in their child's struggle to control inappropriate and troubling behaviours, so attending a parent training programme can be quite helpful. Offer children praise and encouragement when they are cooperative. Parents should refrain from arguing with children and make it clear that they will not be engaged in confrontational displays. Establish reasonable and age-appropriate behavioural expectations and be consistent in following up with consequences for disobedience. Parents should learn and utilise stress management techniques. This will not only help them to cope with the pressures of raising a child with ODD, but will also provide good examples for their children.